Benching systems are an ideal setup for workspaces that want to foster collaboration. 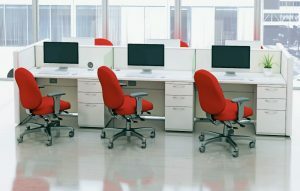 As opposed to traditional cubicles that have high walls separating employees, benching systems are one long shared work surface that allow employees to sit directly next to each other. Benching systems are also great for loft offices, and create a modern, trendy look for an office space. What’s more, benching systems are extremely efficient as they can provide a work area for several employees with a minimal foot print, and can be easily added onto should your workforce continue to grow. If you’d like to learn more about the benching systems we currently have available for your business in the Roswell area, contact NorthPoint Office Furniture today.